Gunsmoke Paintball is located in Maldon Road, Layer Marney, just outside of Colchester in Essex and can provide you with an excellent paintball experience for your corporate team building event, paintball parties for 8 to 11 year olds, lasertag for all age groups, paintball for younger players (12-16 year olds), walk on players last Sunday of each month (prebooking essesntial), regular players, clubs, stag parties, hen parties, young guns, birthdays, and anyone wishing to try the great sport of paintballing. We are a well run, fully insured and have a 100% safety record and are an established UK Paintball Sports Federation registered site. Catering for players of all abilities in the Essex/East Anglia paintball region and being ideally situated on the Suffolk and Essex borders, Gunsmoke Paintball can easily be reached via the A12 and the B1022 and is ideally located with good road links. Come and Play! 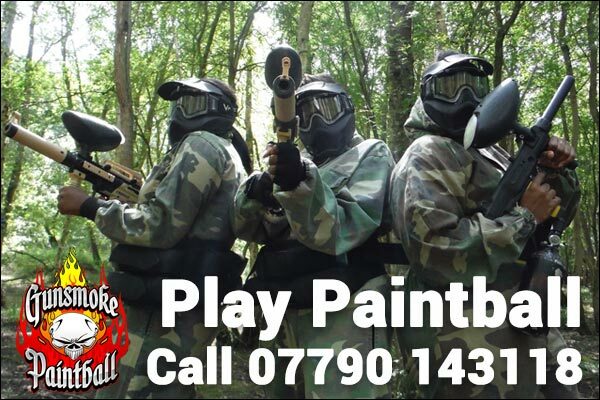 Arrange your booking today and contact Julie on 07790 143118 or alternatively email Julie@gunsmoke-paintball.co.uk. Come and play paintball at Gunsmoke Paintball. We pride ourselves on giving you a great paintball experience at a cost that won’t break the bank. Purpose built over 31 acres of land, Gunsmoke Paintball is the ultimate location for beginners and experienced paintballers alike with a variety of challenging fields. Whatever the occasion (paintball birthday parties, corporate entertainment, team building, clubs, schools, youth groups or walk on players) we have the perfect package to suit everyone. Walk on players are welcome last Sunday of each month however pre-booking is essential. Using the Battlefield Rifle Pro is really just like playing first person shooter games such as Call of Duty or Modern Warfare. The Battle Rifle Pro comes with 8 default weapon types – the Battle Rifle, Burst Rifle, SMG, Heavy Machine Gun, Shot Gun, Sniper, Battle Cannon, and Assault Laser. Each weapon preset includes unique characteristics like range, damage, clip size, reload speed, and rate of fire along with different sound effects to make the action even more real. 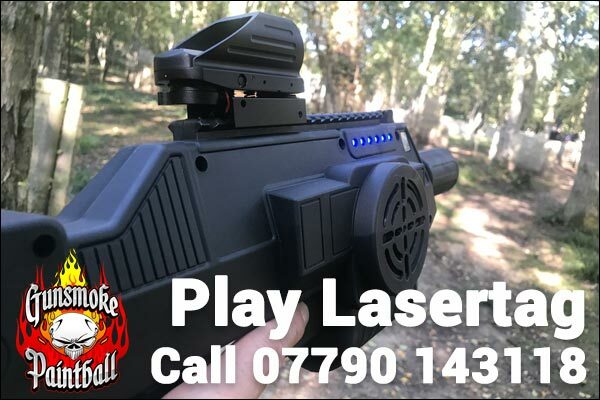 Low impact paintball using pump action splatmaster markers, designed especially for 8 to 11 year olds, you can now experience the thrill and excitement of playing paintball. You need to have parental consent and parents are also welcomed to attend (at least 1 adult must be in attendance) and we have a secure indoor safe area where refreshments are available. Minimum numbers for a booking is 10 players. Bookings are for 1 hour durations and we supply everything needed to play. The £20 game fee includes hire of JT Splatmaster pump marker, VForce Thermal Goggles, Armoured Chest pad and unlimited paint. To book your paintball party, simply call Julie on 07790 143118 or alternatively email julie@gunsmoke-paintball.co.uk. We welcome younger players at Gunsmoke Paintball, you need to be between 12 – 16 years old and have parental consent and be ready for a fun packed exciting day. Junior paintballers are the future of the sport and we do everything to encourage them to get to have a great time playing paintball. It is also something parents can join in with too. We supply you with everything you need to play paintball – paintball marker, protective goggles, overalls, pots and harness and of course paint. We even give our younger players a special rate too – £30 price inclusive of gun hire, equipment and 500 paintballs. 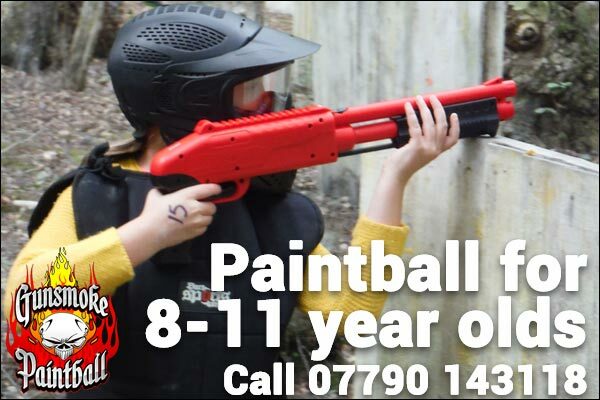 To book any of the activities please call Julie on 07790 143118 or email Julie@gunsmoke-paintball.co.uk. Alternatively you can you use our main contact form below if you prefer – please complete as fully as possible. Please note that we will confirm bookings with you so please ensure that you supply a contact number. To avoid any disappointment, you MUST book in or call in to reserve your place rather than just turning up on site on the day. We are a family run business and we love paintball and outdoor activities and aim to bring you the best paintballing and laser tag experiences and at a great price. For 8 to 11 year olds and using low impact Splatmasters along with fragile paintballs. 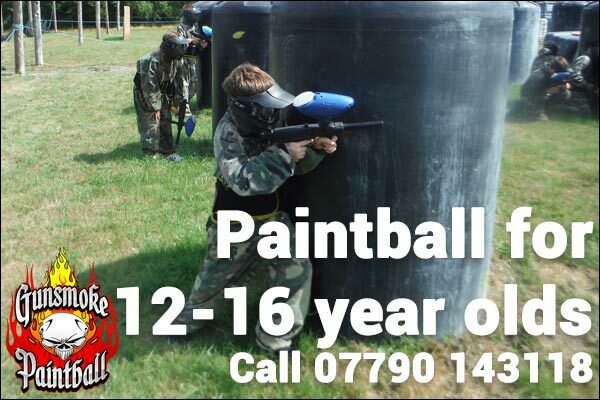 For 12 to 16 year olds, we do regular paintball for our younger players and at a special rate too. A new addition to the site. These are state of the art laser tag markers and it really is like Call of Duty and not like Quasar at all! With a choice of 8 fields, you can be sure of a great day paintballing at a cost that won’t break the bank. Last Sunday of each month is especially for walk on players and prebooking is essential.